Usually harvests in early summer and stores into mid winter at room temp. 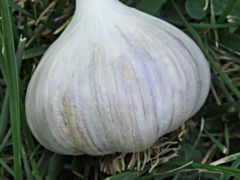 Ukraine can grow into a big, robust, hardy, hardneck garlic. 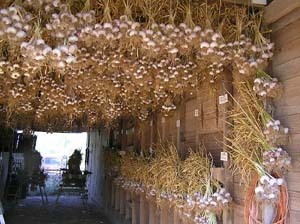 If you grow Porcelains or other later harvesting, longer storing garlics, you should also be growing this early harvesting hardneck and saving the longer storing ones for later. Grows well in most areas of the USA. Taste test - I bit a good size plug out of the top a medium large clove, about one third of the clove and sat back to see what life had to offer for the next minute. Ukraine was crisp and crunchy with a light taste very much reminescent of shallots with a little sharpness of four to five on a scale of ten and there was a warm rich aftertaste that lingered for a few minutes. Actually, it was a delightful raw snack devoid of heavy garlickiness. 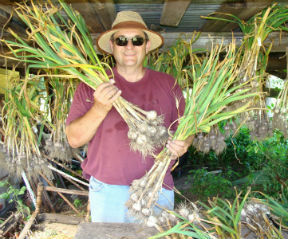 This garlic will be excellent for salads and pesto among other raw uses where you might want a light but snappy garlic.